Maysaloon - ميسلون: Syria: Hezbullah's Quagmire? Nasrallah's speech earlier today was, rhetoric not withstanding, a declaration of war on Syria. Syria, as some people would like us all to forget, is not the Assad regime, it is the Syrian people. And it is the Syrian people that are revolting against Assad, a fact that Nasrallah conveniently ignores in his discourse. His talk today was couched in the same kind of vague language that the Syrian regime uses to refer to the "crisis", with veiled references to "outside actors" without mentioning names, and with promises that details may perhaps be revealed "in future". That is all fluff, and observers will notice that the rhetoric Nasrallah uses to explain Hezbullah's sometimes controversial (to his followers) behaviour is intended to filter down the cult of resistance pyramid - to politicians, journalists, and social media - and shape the discourse. In this way he creates the epistemic grounds for legitimizing what his party does. But that is another blog post for another day. Most interesting to me was Nasrallah's statement regarding Damascus. He promised that Damascus would never fall militarily and I believe he means what he says. It is one thing when all of us feel that a sustained push against the regime in Damascus is long overdue, but another thing when Nasrallah confirms this view because that means that somebody is in a position to try and take the city soon. The statement that the city will "never fall" can mean two things, and neither bode well for the Damascenes and other Syrians who have fled there. The first is that Hezbullah (and Iran) may be heavily invested in the capital and will emerge in full force to support Assad when the campaign begins, and secondly that there will be such a rain of destruction on the city that Aleppo will look like a walk in the park in comparison. Assad's artillery and bases on Mount Qasiyoon, overlooking Damascus, have been raining destruction on the city suburbs for almost a year, and can easily level the old city if it looks like the regime will lose it. But this is not yet the case, and here it looks like Nasrallah's warning is intended to point to an alternative that he desires, negotiations. But these are not the negotiations that most people would understand. I've said previously that when Assad's allies speak of "negotiations", they use a different meaning. Assad will use "negotiations" to refer to discussions with a loyal opposition, whilst his allies really mean negotiations between the United States and Russia on one level, and perhaps an uneasy understanding between the Gulf states and Iran on the other. The elephant in the room is the Syrian opposition in all its flavours, from the Muslim Brotherhood to the Muaz al Khatib current. This is because they are the only party that Assad and his allies cannot allow to operate freely within Syria. To allow any of these currents will mean genuine political plurality and a real challenge to the regime, therefore its downfall. The recent, and controversial, statement addressed to him by Muaz al Khatib appears to have not even registered with Nasrallah. Instead he chose to focus, as an ally of Assad, purely on the narrative that there is an international conspiracy against the Syrian regime and that negotiations should really be with the "foreign backers" of these armed gangs. This is unfortunate and he may come to regret this olive branch later, especially when the fighting reaches Lebanon - and it will at some point. Between Assad negotiating with his loyal opposition, and his foreign allies pushing for the world to abandon Syria's revolution, the real Syrian opposition in all its spectrums, is to be starved to death, and the Syrian people will be returned back to their fifty year induced coma. In summary, Nasrallah has dug in his heels over Assad's regime and declared war on Syria. His party will fight on under the pretence of protecting Lebanese in the country, and on the pretence of protecting the shrine of a woman who is revered by Sunnis as well as Shiites. Hezbullah is now fully embroiled in the Syrian quagmire, and has committed itself to supporting the Assad regime. This is a grave error of judgement for while Hezbullah might be strong in Lebanon, it is not strong in Syria. One need only recall the dreadful blow it received through the assassination of Imad Mughniyeh in Damascus a few years ago, right in the heart of Assad's security district. Furthermore, Hezbullah's soldiers are not familiar with the territory they are fighting in, and they are far from their supply lines and support base. It is clear they have been having an extremely difficult time in the Qusayr, which may be part of the reason why he chose to address his followers about it and also to justify the involvement. Finally, whilst the situation in Lebanon is still not serious enough to concern him, politics in Lebanon can escalate very quickly. By underestimating his domestic opponents and involving himself with a costly fight in Syria, Nasrallah will compound his errors and find himself biting off more than he can chew. Nasrallah told us tonight that it is not important how "you" understand the situation (regarding Shiite interests in Syria), but how other people (his people) see it. 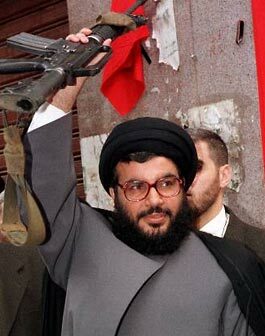 But with his fighters trickling back to Lebanon in boxes, Mr Nasrallah seems to be misreading the situation. The only people who's understanding he needs to consider carefully is that of the Syrians, and they have already made their views of his involvement very clear. It was not long ago that Israel slipped away during the night after its failed and costly involvement in Lebanon. Today Hezbullah appear to be making the same mistake.